According to newspaper accounts, Ethel didn’t die easy. For 10 days in November 1918, she lingered in a Richmond hospital before succumbing to her injuries, caused by two bullet wounds through her left lung. In the last days of her life, between labored breaths and unimaginable pain, Ethel dictated her will to her mother and bequeathed “many pieces of diamond jewelry” to her mother, Carrie Grace Schneittacher. Carrie had come down from Girard, Pennsylvania so that Ethel Mae wouldn’t die alone. Ten days earlier, Ethel Mae Brown had stepped off a train in downtown Richmond to meet her lover, Ralph E. Walker. It was a Wednesday night, about 7:00 o’clock, on a typical November night with temps in the mid-40s. Ethel and Ralph had met at Penniman, a World War One munitions plant on the York River. Ralph did the same work at Penniman as he’d done back home in Chattanooga: He managed the livestock at the plant. Ethel was a foreman, probably in the shell-loading area. Both Ralph and Ethel were married, but not to each other. Eyewitnesses later told police that there was an argument between the two as they stood on the sidewalk at 14th and Main Street. Ralph (55) pulled a pistol from his pocket and shot Ethel Mae (38) twice in the left chest at close range. She fell to the ground immediately. He then pointed the pistol at his own chest, and fired two shots before collapsing on the sidewalk. Splayed on the sidewalk, bleeding out from two wounds, Ralph managed to prop himself up on one elbow, point the pistol at Ethel and fire two more bullets at her, with one bullet grazing her head. Richmond Patrolman Walter M. Angel had just passed the couple moments earlier. Upon hearing the gun shots, he rushed back to the corner, and saw the horrid scene. Using a citizen’s vehicle, Ethel was rushed to Virginia Hospital, about one mile away. Another patrolman rushed Ralph to the hospital, where he died less than 30 minutes later. It was November 13, 1918. The Great War had ended two days earlier. While the entire world celebrated, Ralph fretted. Soon, he’d be separated from his sweetheart. Back in Chattanooga, Ralph had a wife and six children, one of whom (Ralph, Jr., age 28) had become an invalid after a terrible street-car accident. Ralph, Sr. came from a prominent Chattanooga family, and was the youngest son of Judge Dawson Walker, and the brother of Judge Seth Walker. Ralph’s work had always centered around buying, selling and managing livestock. 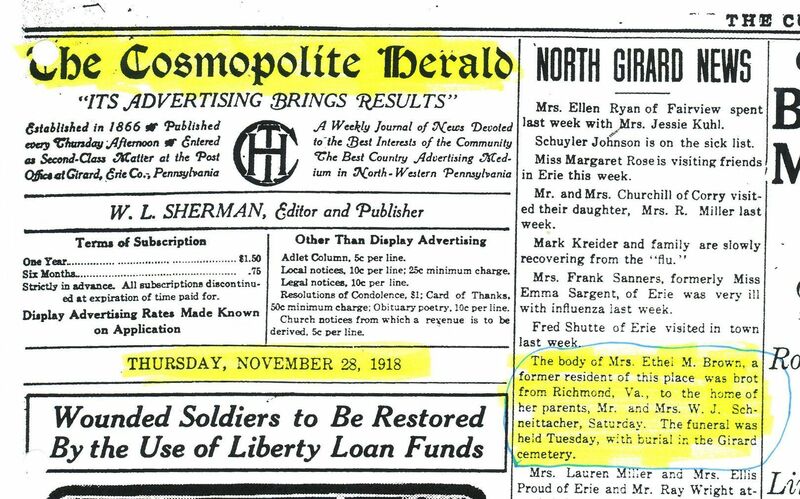 In the wee hours of November 22, 1918, Ethel breathed her last, “with the secrets of this [story] still locked in her heart” (Richmond Times-Dispatch, November 23, 1918). Her body was prepared by Henry W. Woody Funeral Home of Richmond and shipped to Girard later that day. Until a couple days ago, that’s a summary of everything we knew about Ralph and Ethel. Thanks to Genealogist Extraordinaire Milton Crum and Ohio Historian Ashley Armstrong-Zwart, we now know quite a bit more about Ethel. Ethel and her mother misrepresented Ethel’s age on several legal documents, but we now have a confirmed birth date of October 23, 1880. Her father was Wilford Joseph Schneittacher and her mother was Carrie Grace Young Schneittacher. Carrie was born in 1865, and she was only 15 when Ethel was born. On June 3, 1905, Ethel married Dr. Sydney R. Titsworth in Manhattan. The two had met at J. Hood Wright Hospital (also in Manhattan). Sydney didn’t tell his poor blind mama about his marriage for more than a year. When he went home to Plainfield, New Jersey, he sprung the news on everyone. The story of the young doctor who returned home with “a diploma and a bride” was a headline in the New York Times (June 14, 1906). 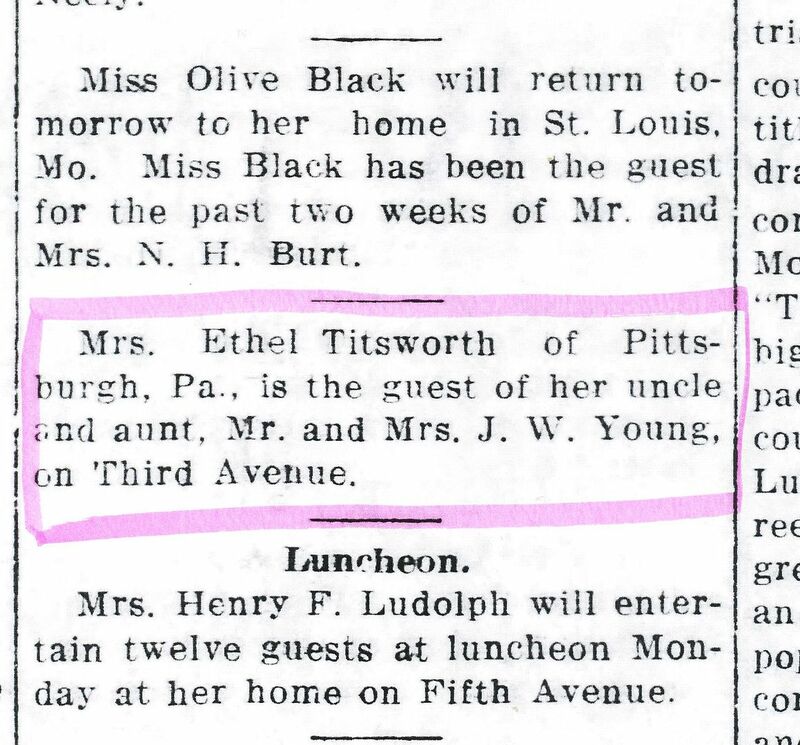 The newspapers said that Ethel made a statement to the police, informing them that her husband was “a prominent physician in Pennsylvania.” Milton and I thought Ethel was talking about Sydney R. Titsworth. We were wrong. And we also assumed that Ethel had created the pseudonym of “Mrs. Brown” in order to hide her true identify. We were wrong about that too. Our big break came when Milton discovered that Ethel was enumerated twice in the 1910 census. 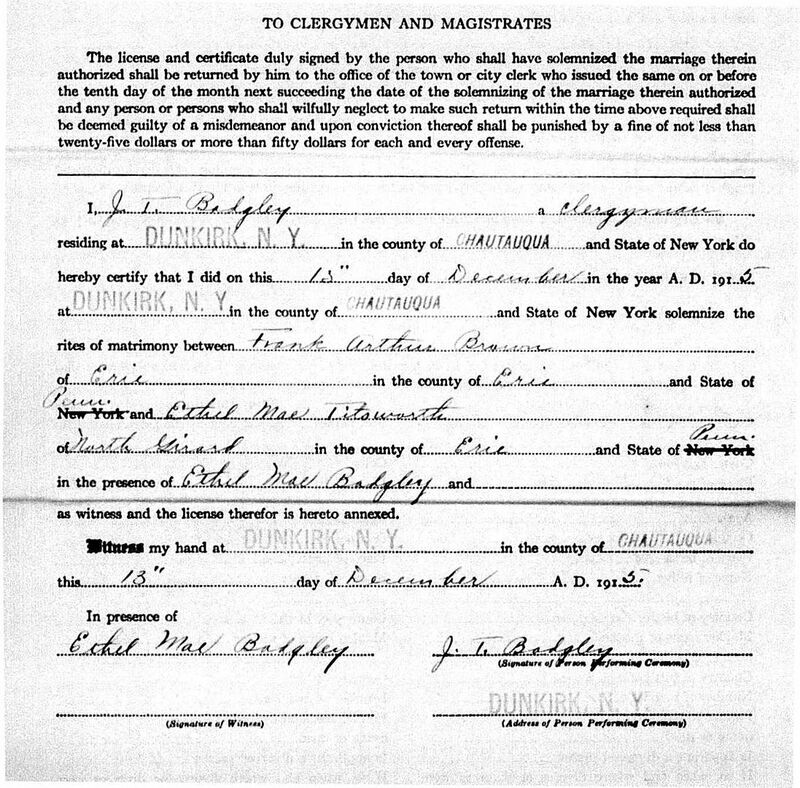 She was enumerated in early April, living with her physician husband in Bridgeport, Connecticut, and then ten days later she was enumerated again, this time as a boarder in Manhattan, and working as a manicurist. In other words, there was trouble in paradise. Sometime between those two enumerations, Ethel grabbed her diamond jewelry and left Dr. Sydney R. Titsworth, landing in Manhattan at a rooming house. 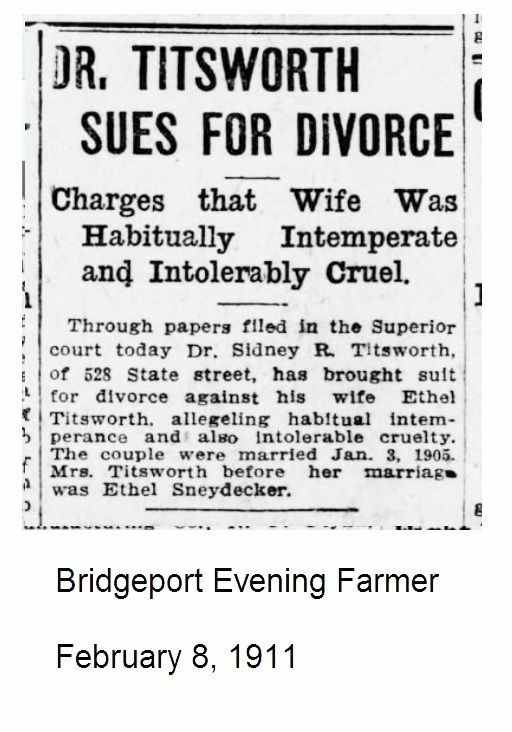 In 1911, the good doctor sued his soon-to-be-ex for divorce. Seems that Ethel was a friend of the drink, and to hear Sydney tell the story, she was a mean drunk. By 1912, Ethel was back in Pennsylvania, working in Erie as a corset dealer at 924 State Street. In December 1915, Ethel married Frank Arthur Brown, and lied about her age on the marriage certificate. Most likely, Ethel headed off to Penniman in the Summer of 1918, about 2-1/2 years after marrying Frank. The 1910 census shows that Frank was a laborer, and his 1917 draft card showed he was a laborer at American Fork and Hoe Company. On May 26, 1918, Frank became something else: Part of Pershing’s American Expeditionary Force. Private Frank Brown survived one of the worst battles of World War One: The Meuse-Argonne Offensive. It raged from September 26, 1918 until the end of the war, November 11, 1918. More than 26,000 Americans died and 95,000 were wounded. Frank survived with no permanent physical injuries. While Frank was serving his country and trying to stay alive in the mud-filled trenches on the Western Front, Ethel was serving in the second-line trenches at Penniman, and in her spare time, she was playing “who’s got a secret” with the guy in the stable. Ralph Walker, the man with a wife and six children in Chattanooga, told several people that he had a “sweetheart” at the plant. He also told the lady who ran his rooming house that she shouldn’t be surprised if she came into the room one morning and found that he had killed himself. When Ethel got off that train in Richmond on Wednesday night, she was probably returning to Penniman to pack up her things and go home. The previous few days, she’d been on a short vacation in Girard, visiting the folks back home. The war was over. Perhaps Ethel decided that it was time to end the affair and go back home to Pennsylvania and get on with her life. Frank would be coming home soon, and she could forget all this ever happened. Instead, standing on a sidewalk in Richmond, still wearing an expensive diamond brooch and “handsome diamond ring,” she was mortally wounded when an angry lover pressed a gun to her chest and pulled the trigger - twice. In death, Ethel didn’t fare much better. The story of her very bad ending was kept out of the papers in and around Girard. Her hometown paper, The Cosmopolite Herald, which detailed every citizen’s runny nose, sprained ankle and wandering chicken, had almost nothing to say about Ethel’s death. In a newspaper where even an infant’s death merits a front-page 200-word obituary, how did Ethel get overlooked? It must have been intentional and/or a gentleman’s agreement with Mr. and Mrs. Schneittacher. Ethel Mae Schneittacher Titsworth Brown was buried in Girard Cemetery with the simplest of markers. The only child of Carrie Grace and Wilford Joseph Schneittacher rests alone in the cold ground. Cemetery records show that three plots were purchased for the three Schneittachers, but only Ethel’s plot was used. 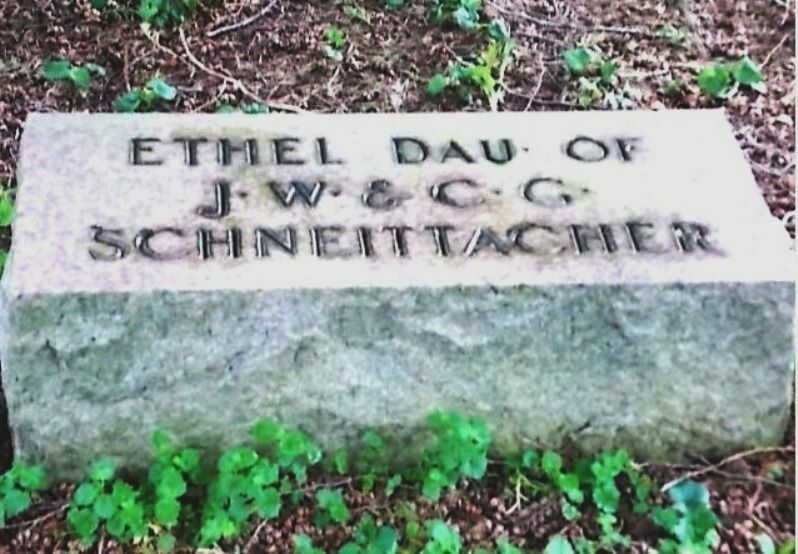 The remnant of the Schneittacher family lies in Gustavus Cemetery, more than 50 miles south of Ethel’s grave site. Some may ask, is this really a story about Penniman? Yes, I’d say it is. It provides a thumbnail sketch about what happens in war time when people are put under difficult circumstances and endure grievous dangers and hardship. In short, it’s a story about the people of Penniman, and that’s what makes history so enchanting. Thanks to Milton Crum, Ashley Armstrong-Zwart and Anne Hallerman for their help and brilliant research work! To read an earlier article about Ralph and Ethel, click here. Ralph (from Chattanooga) and Ethel (from Erie) met one another at Penniman, Virginia, a World War One munitions plant and village, built by DuPont. At its peak, more than 15,000 people inhabited the 6,000-acre site on the York River. Penniman was established in Spring 1916, and by 1921, it was a ghost town. Ralph and Ethel were only two of the 6,000 workers employed at Penniman. 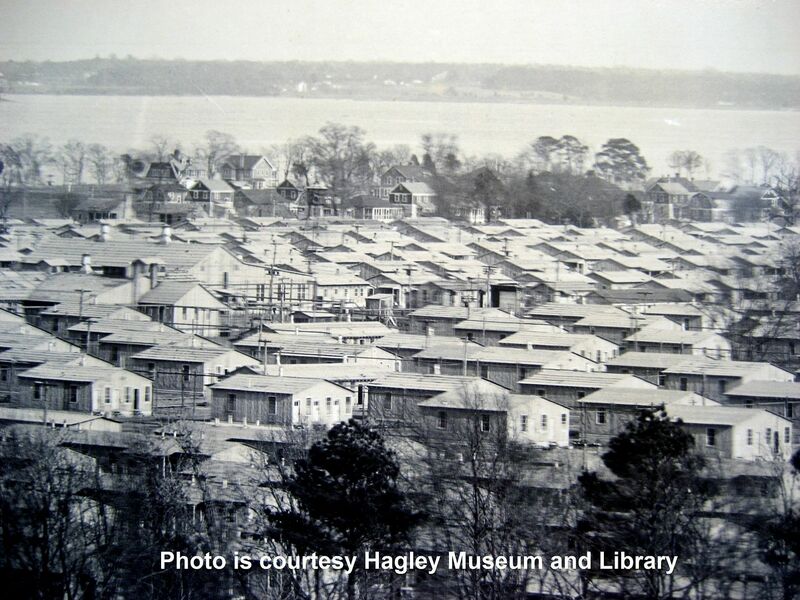 After the war, Penniman was disassembled and in 1942, the land was purchased for use by the Navy (Cheatham Annex). Ethel's story appeared in "The Chattanooga News" on November 16, 1918. 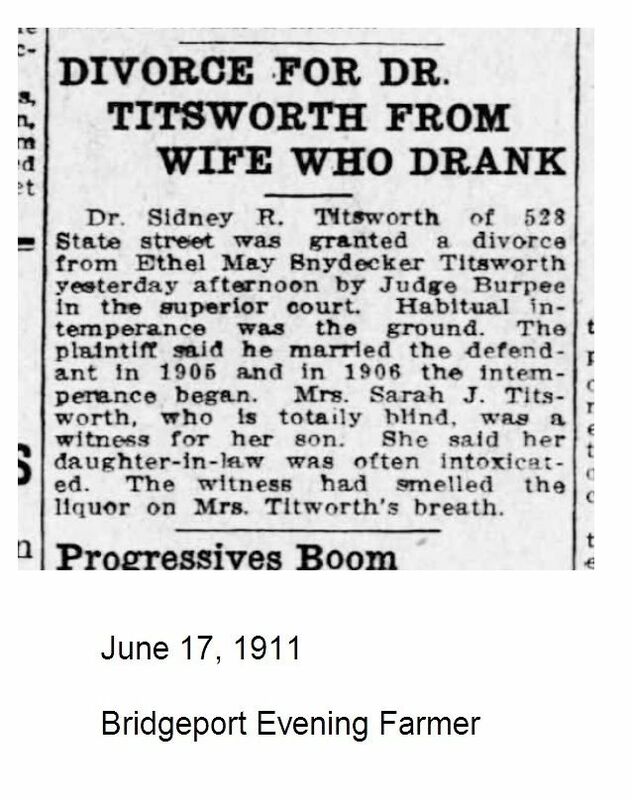 In early 1911, Dr. Titsworth sought a divorce from Ethel. And the divorce was granted a short time later. 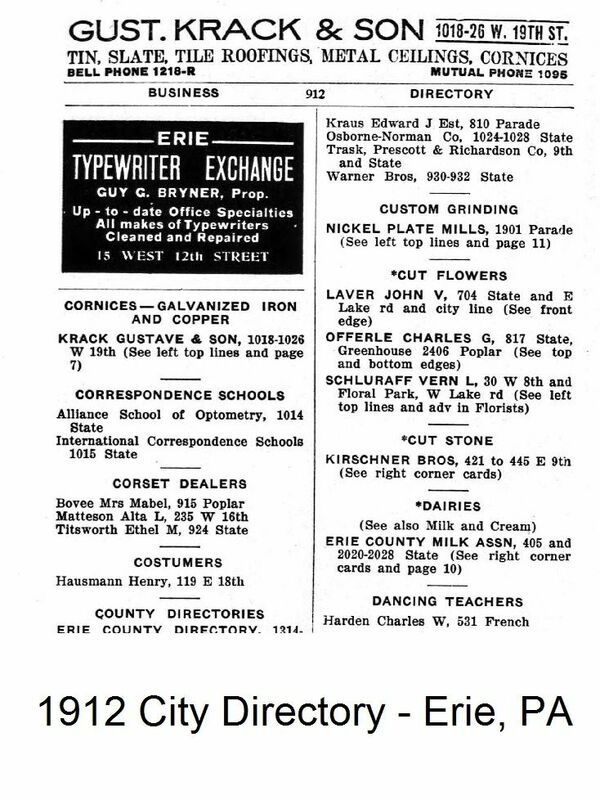 The 1912 directory shows that Ethel is a "corset dealer" in Erie. Even after the divorce, Ethel kept the name. On December 15, 1915, Ethel married Frank Arthur Brown. 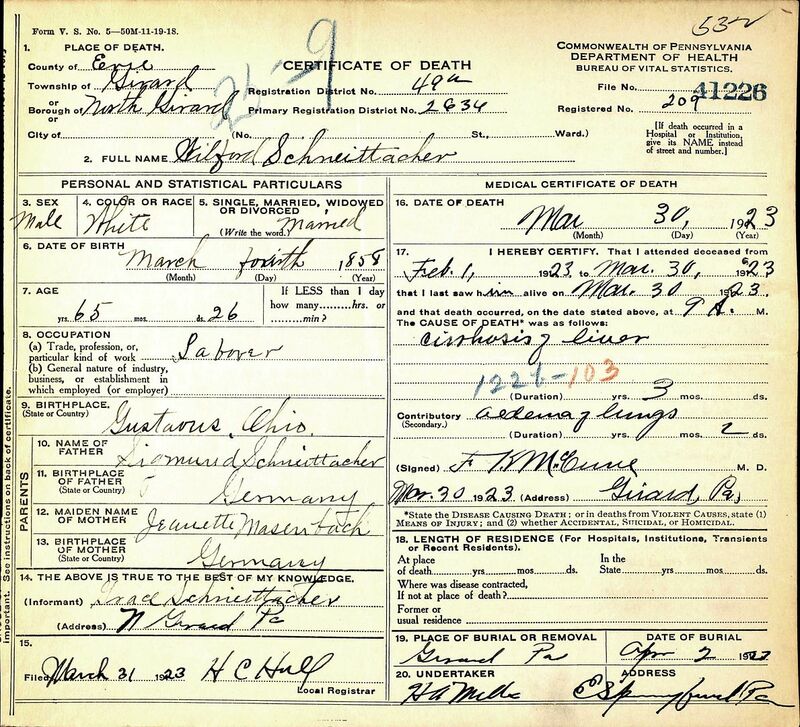 Ethel's father died on March 30, 1923 from cirrhosis of the liver. Did he become an alcoholic after his little girl's death or was that a contributing factor to Ethel's many problems? In a town where every sniffle makes the news, it's hard to believe that this was the only mention of Ethel's death. Ethel Mae Schneittacher Brown rests alone in the Girard Cemetery, with her grave marked with the simplest of headstones, offering only the barest facts as to her life and death.